“There’s a bridge connecting Heaven and Earth. 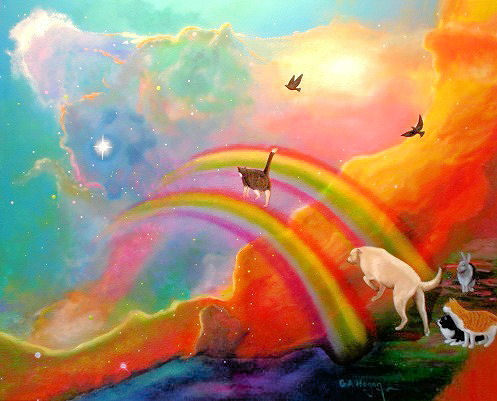 It is called the Rainbow Bridge because of its many colors. Just this side of the Rainbow Bridge is a verdant land of meadows, hills, and valleys with lush green grass. When a beloved pet passes, the pet goes to this place. There is always food and water and warm spring weather. Old and ill and frail animals are made whole. They play all day with each other in the beautiful sunshine. They are happy and content, but there is one thing missing. They are not with their special person who loved them on Earth. So, each day, they run and play until the day comes when, suddenly, one stops playing and looks up! The nose twitches! The eyes are staring! And this one suddenly runs from the group! You have been seen, and when you and your special friend meet, you take him or her into your arms and embrace. Your face is kissed again and again, and you look once more into the eyes of your trusting pet. The UCLA Henry Samueli School of Engineering and Applied Science is currently ranked highly in several research areas by Microsoft Academic Search. This includes a no. 1 ranking worldwide for electrical engineering by H-index over ten years. This dynamic worldwide ranking also places aerospace engineering at no. 8, and computer science at no. 9 and the school at no. 4 overall, throughout the same time period by H-index. H-index measures both the productivity and impact of published work. UCLA Engineering faculty, students and researchers all consistently publish papers on their research in top professional and scholarly journals, and are regularly invited to present their work worldwide at symposiums. They have authored numerous books, many of which have been translated to various languages and are regularly called upon to serve as experts to the media. The Microsoft Academic Search, currently being beta tested, is a search engine developed by Microsoft Research Asia to help users quickly find information about academic researchers and their activities. With academic search, one can find top researchers, their papers, conferences and journals. It also contains visualization features like co-author graphs, co-author paths, paper citation graphs, domain trends, and organization comparison charts. At present, one can explore nearly 39 million publications and find more than 19 million authors with information being updated regularly. Microsoft Research Asia is a subsidiary of Microsoft Research, which was founded in 1991. Since its founding, it has grown into one of the largest and most respected software research organizations in the world. Currently, more than 850 computer scientists, sociologists, psychologists, mathematicians, physicists and engineers work in eleven labs, across four continents, in an effort to advance the state of the art in computing through a combination of basic and applied research. In addition, researchers at Microsoft work across more than 60 disciplines within areas like: communication and collaboration, computational sciences, design, economics, education, health and well-being, search, security and privacy. You are currently browsing the Kurt's Thoughts blog archives for May, 2012.